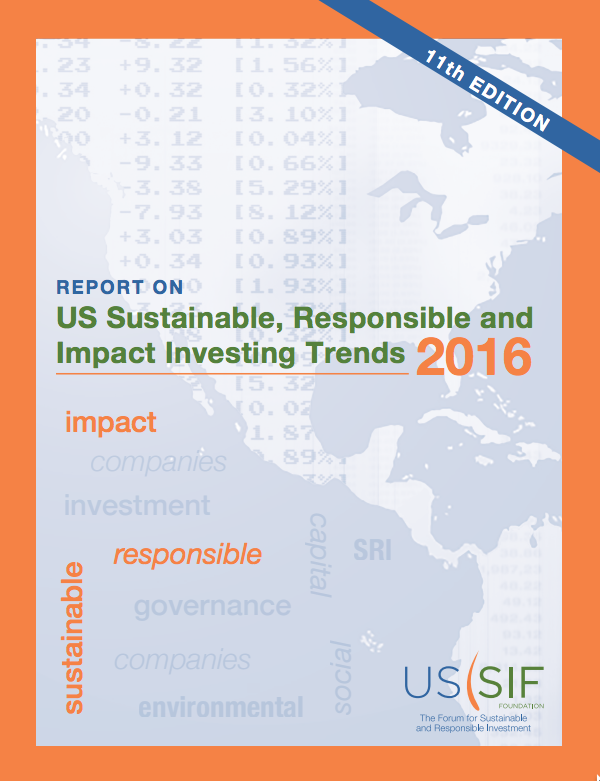 US SIF Foundation Releases 2016 Biennial Report on UA Sustainable, Responsible and Impact Investing Trends. Sustainable, responsible and impact investing (SRI) assets now account for $8.72 trillion, or one in five dollars invested under professional management in the United States according to the US SIF Foundation’s biennial Report on Responsible and Impact Investing Trends 2016, which was released today. The trend of robust growth in sustainable and impact investing is continuing as investment managers apply ESG criteria across broader portions of their portfolios, often in response to client demand. Asset managers, institutional investors, advisors and individuals are moving toward sustainable and impact investing to advance critical social, environmental and governance issues in addition to seeking long-term financial returns. A diverse group of investors is seeking to achieve positive impacts through such strategies as shareowner engagement or investing with an emphasis on addressing climate change, corporate governance, and human rights including the advancement of women. We have been a sponsor of the Trends Report since 2010 as it is the most detailed and meaningful study of sustainable and impact investing available. It supports our efforts to promote an informed and engaged citizenry, to fight injustice and to protect the diversity of nature as well as our own efforts to have a 100% mission aligned endowment. Sustainable, responsible and impact (SRI) investing assets have expanded to $8.72 trillion in the United States, up 33% from $6.57 trillion in 2014. Much of this growth is driven by asset managers, who now consider environmental, social or corporate governance (ESG) criteria across $8.10 trillion in assets, up 69% from $4.8 trillion in 2014. The top two issues considered both by these money managers and by their institutional investor clients is conflict risk and climate change. These two segments of assets, after eliminating double counting for assets involved in both strategies and for assets managed by money managers on behalf of institutional investors, yield the overall total of $8.72 trillion, a 33% increase over the $6.57 trillion the US SIF Foundation identified in sustainable investing strategies at the outset of 2014. The top reasons managers report incorporating ESG factors include client demand (85%), mission (83%), risk (81%), returns (80%), social benefit (78%), fiduciary duty (64%) and regulatory compliance (22%). The number of investment vehicles and financial institutions incorporating ESG criteria continues to grow and includes mutual funds, variable annuities, ETFs, closed-end funds, hedge funds, VC/private equity, property/REIT, other pooled investment vehicles, and community investing institutions. Additional Trends Report findings and information available. The US SIF Foundation, along with research team members at Croatan Institute, distributed an online information request to money managers and institutional investors from March through August 2016. The research team also reviewed annual reports, financial statements, SEC forms ADV by money managers, IRS 990 filings by nonprofit organizations and 5500 filings by plan sponsors. It also gathered data from third-party providers and trade associations of community investing institutions, investment companies and institutional investors. The 2016 Trends Report is based on research of the SRI activities of 797 money managers and 1,660 institutional investors who were asked to detail whether they considered ESG issues in investment analysis and portfolio selection, to list the issues considered, and to report the value of the US-domiciled assets as of December 31, 2015. Register for the media teleconference, 10 AM PST. The US SIF Foundation is a 501(c)(3) organization that undertakes educational, research and programmatic activities to advance the mission of US SIF. The Foundation houses the Center for Sustainable Investment Education, which serves the growing need of investment professionals in the United States to gain expertise in the field of sustainable, responsible and impact investment. The Center provides education, trainings, research and thought leadership on sustainable investment to investors, investment advisors, consultants and analysts. US SIF: The Forum for Sustainable and Responsible Investment is the leading voice advancing sustainable, responsible and impact investing across all asset classes. Our mission is to rapidly shift investment practices towards sustainability, focusing on long-term investment and the generation of positive social and environmental impacts. US SIF members include investment management and advisory firms, mutual fund companies, research firms, financial planners and advisors, broker-dealers, community investing organizations, nonprofit associations, and pension funds, foundations and other assets.